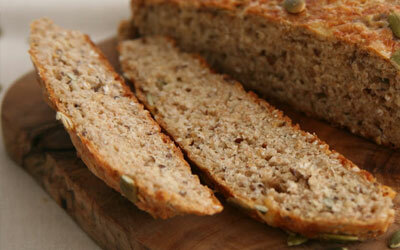 Bread Recipes for St. Patrick's Day! 1. Take a large bowl and put on rolled oats, buttermilk and molasses. Then mix it very well into a batter. 2. Whisk all flour, salt, baking soda and cream of tartar together, and then put buttermilk mixture on it. Stir well. 3. Turn dough out onto a lightly floured work surface. Then knead 3-4 times until dough holds its shape. 4. Divide the dough. Roll each part into a 6 inch round loaf. 5. Take a sharp knife. Then cut it deeply score each loaf in quarters, cutting 1 inch deep. 6. Wrap each loaf in plastic wraps. Allow to stand at least 12 hours at room temperature, to ferment. 7. Preheat oven to 400 degree F.
8. Take loaves and place it on an ungreased baking sheet. 9. After the loaves are baked for 15 min, reduce heat to 350 degree F. Continue to bake until loaves turn brown. Try will make a hollow sound when tapped on the bottom. This should take about 20 minutes. 10. Before slicing allow breads to cool for 10 min. slice loaves 3/4 inch thick all across the loaf. After that cut slice in half and serve. 1. First you should preheat oven to 375 degrees F and lightly grease a large baking sheet. 2. Take a large bowl and add flour, sugar, baking soda, baking powder, salt and margarine and mix it. Stir in 1 cup of buttermilk and egg. Turn into dough out onto a lightly floured surface and knead slightly. Form dough into a round and place on prepared backing sheet. Take a small bowl. Add melted butter and 1/4 cup buttermilk and mix it. Brush loaf with this mixture. Take a sharp knife and cut an 'X' into top of the loaf. 3. Bake in preheated oven for 45 to 50 min. You may continue to brush the loaf with the butter mixture while it bakes. Boil the potatoes in their jackets, pull off the skins and mash straight away. Add the egg, butter, flour and herbs (if using) and mix well. Season with plenty of salt and pepper, adding a few drops of creamy milk if the mixture is too stiff. Shape into a 1-inch round and then cut into eight pieces. Dip in seasoned flour. Bake on a griddle over an open fire or fry in bacon fat or melted butter on a gentle heat. Cook the fadge until crusty and golden on one side, then flip over and cook on the other side (about 4 to 5 minutes on each side). Serve on its own on hot plates with a blob of butter melting on top. Preheat oven to 350°F. Lightly grease a baking sheet; set aside. In a large bowl combine flour, whole wheat flour, baking powder, baking soda and salt. Stir in raisins and caraway seed. Add as much buttermilk as needed to make a firm dough, but not dry. Turn dough onto a floured surface. Knead until smooth, about 3 minutes. Shape into a round loaf. Score the top with a deep cross-hatch pattern. Place on baking sheet. Bake for 35 to 40 minutes or until a toothpick inserted in the center comes out clean. Place blueberries in a small saucepan; add nectar to barely cover berries. Bring to a full boil, then remove from heat and let stand until cool. Drain, discarding liquid. Stir together flour, salt, sugar and baking powder. With a pastry blender or 2 table knives, cut in butter until mixture has texture of coarse meal. Beat eggs and egg white into cream; add to flour mixture, stirring just until moistened. Gently fold in blueberries. To bake: Preheat oven to 375 degrees. Transfer frozen scones to a parchment-lined pan; set on a second pan (to prevent overbrowning on the bottom). Bake 12 minutes, rotate pan, and bake 10 minutes more. If scones are browning too quickly at this point, reduce oven temperature to 350 degrees. Continue to bake just until firm, 3 to 8 minutes more. (Total baking time should be 25 to 30 minutes.) Scones should be light golden, not brown. Preheat oven to 450°F (gas mark 8). Sift flour with salt and rub in butter or margarine. For Cheese & Herb Scones add mustard, cheese and herbs to the dry ingredients at this point. Make a well in the centre and pour in the egg and most of the buttermilk. Mix quickly to form a soft dough, adding a little extra buttermilk if necessary. Turn out onto a floured surface and roll out lightly until 1" thick. Working quickly, cut into 2" rounds. Glaze with egg or milk and set on a floured baking sheet. Before baking, dust scones with cinnamon sugar for Buttermilk Scones or sprinkle a little grated cheese on top of each scone for Cheese& Herb Scones. Bake for 15-20 minutes until light brown. In a bowl, mix together flour, salt, sugar, baking soda and baking powder. Cut in butter, then add raisins and caraway seed. Break egg into a measuring cup and add enough buttermilk to equal 3/4 cup. Add the egg mixture to the flour. Mix until blended and knead dough. Shape into one large or two small rounds. Make a cross on top with a knife and drizzle with melted butter. Sprinkle lightly with sugar. Bake in a greased iron skillet, or on a greased cookie sheet, until golden (approximately 30 minutes). "The secret to this tender bread is in your hands: don't overwork the dough--just lightly knead it." The caption under the accompanying photo says "Irish Wheaten Bread splits around the middle as it bakes, sort of like a large biscuit." Combine first 5 ingredients in food processor and pulse until well-blended. With the processor on, drop margarine through food chute, and process for 10 seconds. Combine buttermilk and egg whites; stir well. With the processor on, pour the mixture through food chute, and process for 20 seconds or until dough leaves sides of bowl and forms a ball. Turn the dough out onto a lightly floured surface and lightly knead about 10 times. Pat the dough into an 8-inch round cake pan coated with cooking spray, and cut a 1/4-inch-deep X in top of the dough. Bake at 375 deg. F for 45 minutes or until lightly browned. Remove bread from pan and let cool completely on a wire rack. Cut bread into wedges. Preparation : Cream butter and sugar. Mix flour, salt, baking powder, and add to butter mixture alternately with milk. Add raisins. Pour into 8 X 8-inch pan. Bake at 350 degrees one hour. Cream the yeast and the sugar and allow to froth up in the milk, which should be at blood heat. Sieve the flour, caster sugar and spice and rub in the butter. Make a well in the center and add the yeast mixture and the egg, beaten. Beat with a wooden spoon for about 10 minutes until a good dough forms. The fruit and the salt should be worked in by hand; the gold ring wrapped in greaseproof paper should then be added, and the whole kneaded. Put in a warm bowl, cover and allow to rise in a warm place for about an hour until doubled in size. Knead lightly and place in a lightly-greased 7-inch /15-cm. diameter cake tin and allow a further 30 minutes rising time. Bake near the top of a pre-heated oven at gas mark 6, 400°F, 200°C for 45 minutes. On removing from the oven the brack can be glazed with a syrup made from 2 teaspoons sugar dissolved in 3 teaspoons boiling water. Mix the whole wheat flour thoroughly with the white flour, salt, and soda. Make a well in the center and gradually mix in the liquid. Stir with a wooden spoon. You may need lass, or more liquid - it depends on the absorbent quality of the flour. The dough should be soft but manageable. Knead the dough into a ball in the mixing bowl with your floured hands. Put on a lightly floured baking sheet and with the palm of your hand flatten out in a circle 1-1/2 inches thick. With a knife dipped in flour, make a cross through the center of the bread so that it will easily break into quarters when it is baked. 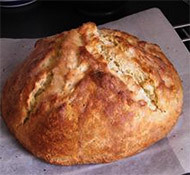 BREAD : In large bowl, combine flour, salt and baking soda. With pastry blender or two knives, cut in butter until mixture resembles coarse crumbs. Stir in raisins or currants (if using). In separate bowl, combine buttermilk, honey and whisky. Add all at once to dry ingredients; stir just until no dry spots remain. Turn dough out onto lightly floured surface. Knead lightly 1 minute (too much handling will toughen loaves, while too little will inhibit rising.) Divide dough in half and shape each half into an 8 in (20 cm) round. Place in two greased 8 in (1.2 L) round cake pans. With floured knife, cut a cross 1/2 in deep in each loaf. GLAZE : In small bowl, combine whisky and milk. Brush loaves with glaze. Bake in 350F (180C) oven 35 to 40 minutes or until loaves sound hollow when tapped on bottoms. Remove from pans; let cool on wire racks. Cut into wedges.